Part 5: Beginners guide to the PIC Microcontroller. So how do you get a program into the PIC microcontroller? Once you have created a program either in assembler or using a high level language and created the hex file you are ready to program the hex file into the device. With these three signals plus the ground reference you can program virtually any PIC device. You can find more information on ICSP here. and typical connections for pic programming using ICSP here. 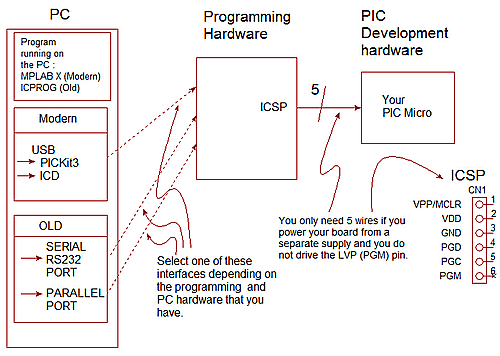 To do the job you need a piece of hardware which interfaces to the PIC ICSP pins and to the PC. The interface you should use is either a PICKit2 or PICKit3. The PICKit3 is the most up to date and allows all PIC devices to be programmed, whereas the PICKit2 is an older version. Software running on the PC translates the hex file into a serial bit stream of data and the pic microcontroller takes care of everything else. There's also information on pic programmers here. The programming hardware holds the Vpp pin at a high voltage to indicate that the PIC device must enter programming mode. Then a stream of data is generated to the PGD pin and along with this a clock signal is sent (PGC). The PIC uses these signals to load up its internal flash memory and program it. Note: The ICSP is a bi-directional interface so the programming software can also read back the contents of the part for verification. Note: When the parallel port interface is used the data is still sent serially by controlling individual pins in the port. Once you have the programmer hardware and programming software in place you won't have to worry about the details - and if you design the hardware carefully you can use the ICSP interface while your circuit is running. This makes using the PIC micro extremely simple as you can leave the ICSP interface connected to the programmer and try out different programs - all..
.. without removing the interface, without removing the ICSP cable. All you do is generate the hex file, hit the programming key in the programmer and check the circuit operation.